You won’t know what you have on hand if your pantry is a jumbled mess. Get organized to save prep time and extra trips to the grocery store! We love the convenience of a pantry for storing non-perishable food and paper goods used every day. A well-stocked pantry is not only convenient, but helps the budget! Meal planning is easier, and knowing what’s there eliminates extra, costly trips to the grocery. We can stock up on frequently-used items when they are on sale and put a nutritious meal together at a moment’s notice with pantry items on hand. Organizing your pantry now will save you time every day, and help keep your family’s food budget under control. Remove everything from your pantry and clean all the shelves with a damp cloth. Now is a good time to decide what shelf organizers and bins you need for your space. A memo pad attached to the door makes it easy to note down supplies needed on your next trip to the store. Keeping an ongoing shopping list means you won’t come home from the store to discover you missed some necessary item. As you replace items in your clean pantry, arrange them by groups — cereals, canned vegetables, snacks and so forth. Arrange back to front by expiration date so you’ll always use the oldest items first. Place items you use the most at eye level and infrequently-used items on upper shelves. Paper goods and overstocks can rest on bottom shelves. Rearrange the goods until you have everything easily accessible and placed where most convenient for you. If, for example, your kids get their own cereal in the mornings, arrange the cereal choices on a shelf that they can reach. Store special treats that only mom doles out in a plastic container housed on a high shelf — out of sight and less of a temptation. Invest in trays, bins and baskets to help keep everything organized. Arrange smaller items — granola bars, dried fruit snacks, applesauce cups — in clear plastic containers with tight-fitting lids to keep them together and make freshness last. Label each container so you know what is stored inside. Stackable containers are a great space-saver. Wire shelves mounted on the inside of the pantry door hold spices and seasoning packets in one handy area. To expand the space ever further, consider a free-standing shelf unit placed at the back of the pantry. Label each shelf so everyone knows what it holds and all items are easy to locate. 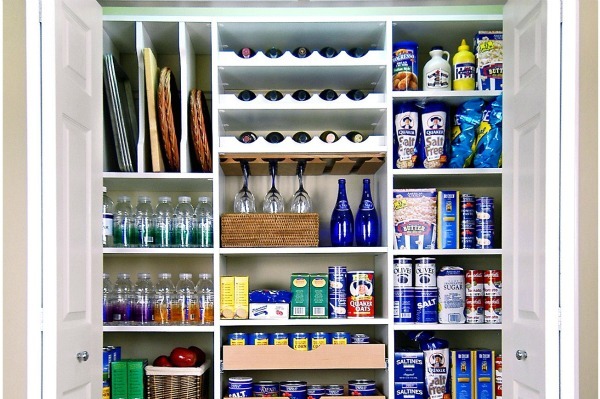 With your newly organized pantry, you’ll know what to buy and which items to purchase in bulk for bigger savings. The easy access you’ve created will save time and eliminate irritation when you prepare meals — and free up more time to use enjoying good home cooking with your family!